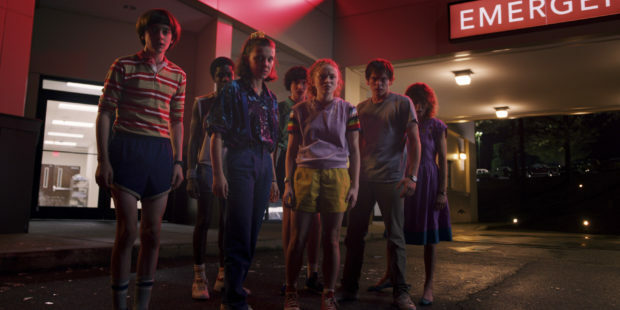 Set in summer 1985, as the residents of Hawkins, Indiana, frolic in the pool, the footage for the upcoming episodes promises “one summer can change everything”. The trailer opens with the group surprising Dustin (Gaten Matarazzo) with a welcome home banner after he is spooked when all his remote control toys start moving in the same direction. As they hide in the shadows waiting to jump out at him, it can be seen that Eleven (Millie Bobby Brown) has a nose bleed. Despite the high jinks it becomes clear things have changed as Mike (Finn Wolfhard) can be heard saying in voice-over: “We’re not kids any more. The trailer reaches a climax with the appearance of the monster baring its teeth and roaring. Stranger Things will return to Netflix on July 4.